While many people know India as a producer of fine teas, it has been growing and exporting exceptional coffees for more than 150 years. Today, India is the fifth-largest producer of Arabica coffee in the world, behind Brazil, Colombia, Mexico and Ethiopia. Legend credits a Muslim pilgrim, Baba Budan, with bringing back seven coffee seeds from a pilgrimage to the Holy Land. He is said to have planted them near his mountain cave in Chikmahlur, Karnataka State, which is now considered the cradle of coffee in India. The commercial cultivation of coffee in India began in 1840, when the British established coffee plantations throughout the mountains of Southern India, where the tropical climate, high altitude, sunny slopes, ample rainfall and soil rich in humus content proved ideal for coffee cultivation. The color, shape, and size of these beans from India, as well as their aroma and taste, are the result of special post-harvest processing. Historically, coffee was shipped to Europe in wooden sailing vessels that took four to six months to sail around the Cape of Good Hope and up to their destinations. Stored below the water line and kept in an atmosphere made humid by seawater seeping through the wood, the beans underwent a transformation on their long journey to market. The bright-green beans would arrive pale gold, doubled in size and with an entirely new cup profile. 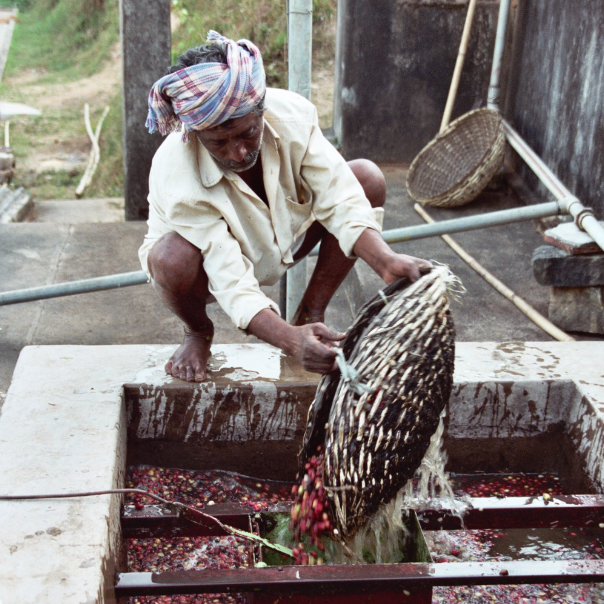 This "monsooning" process was later systematically replicated in India, with the goal of providing European customers with the cup profile they'd first become accustomed to from India and continued to demand. The monsooning process consists of exposing natural coffee beans, in 4- to 6-inch-thick piles, to moisture-laden monsoon winds in a well-ventilated brick or concrete-floored warehouse. This process is carried out on the West Coast of India, making use of the winds from the Arabian Sea during the southwest Monsoon months of June through September. The processing begins with top-grade beans, Arabica cherry AB, that has already been processed by the dry method. To equalize moisture absorption, the beans are raked frequently, followed by bulking and re-bagging at regular intervals. During this 12- to 16-week process, the beans absorb moisture in stages, swelling to nearly twice their original size and developing colors ranging from pale gold to light brown. After several weeks, the coffee is re-bulked, graded again, bagged and moved to a drier region for longer-term storage. The end result is a unique flavor that (like licorice, or cilantro) appeals to a group of ardent fans. It adds interesting notes to a blend and a rich crema to espresso. Spicy, earthy, smoky, tobacco notes, wood notes, medium body, medium acidity.